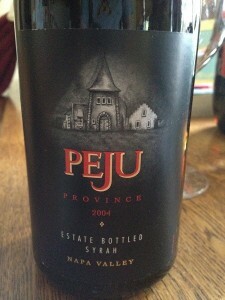 We visited Peju Winery during a recent visit to the Valley in May. Dan and Cynthia scheduled a tasting with Alan (Yodelmeister) Arnopole. If you have not been to Peju, I encourage you to set up a tasting and be sure to request Alan. He is pretty witty and as the name above implies, he likes to “Yodel” and “Wrap” as he describes the wines as you taste. He is quite the character! So at home, our friends Dave and Heather hosted a garage sale at their home. Since we had recently cleaned out the motor home to prepare it for sale, we had a few items to add to their sale. We hung out to help all day on Saturday. As the day ended we started thinking about the pork that Heather had been slow cooking and smoking on the back yard grill. I had of course come prepared… Prior to going to the garage sale, I had ventured down to the cellar and grabbed a 2004 Peju Providence Syrah. Since it was a little warm outside the day of the yard sale, I decided to put the Syrah bottle in the refrigerator for about 30 minutes. The refrigerator is a great way to cool a bottle down quickly. I prefer to drink my reds between 60 and 65 degrees. After a bit, I grabbed the bottle and the cork screw. Everyone was heading out back with the food where we would soon enjoy our meal. Dave grabbed a few glasses and we were good to go! Pulling the cork I could see the bottle was showing some age. It did not look to bad so I was not to concerned. 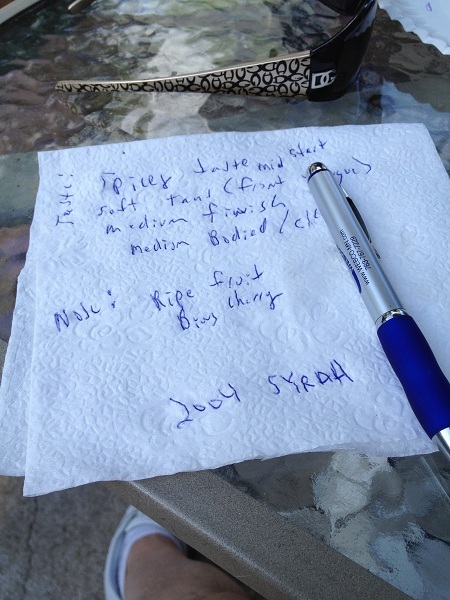 We all sat around the picnic table and I poured everyone a glass. Since I did not have my tasting sheet I grabbed a paper towel. It’s not perfect but it did the trick. 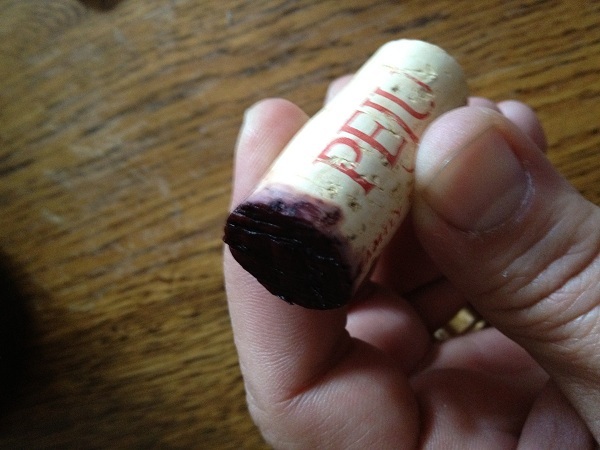 Reviewing the 2004 Peju Syrah I noted a Ruby to Garnet color. The meniscus was a little clear showing the age. 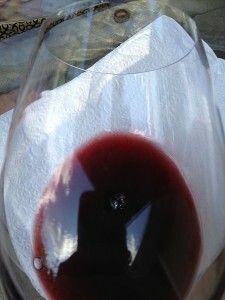 The Syrah was not cloudy and I did not see any sediment in the glasses. We were sitting outside so our noses may not have generalized the distinct smells and could have been influenced by the outdoors. I smelled dark ripe fruit and perhaps noted Bing Cherry. As we tasted it, I picked up “spice”. The tannins were soft with a medium finish. I felt them in the front of my tongue. You could tell the 2004 Syrah was showing its age. The Syrah did pair well with the smoked pork sandwiches we had. The general consensus with everyone one was the 2004 Peju Providence Syrah was voted three glasses. We have five more bottles in our cellar and it is time to drink them up. I don’t create a ton of remarks, however i did some searching and wound up here 2004 Peju Providence Syrah | Bills Wine Wandering. And I do have 2 questions for you if you usually do not mind. Could it be just me or does it seem like some of the responses come across like they are written by brain dead visitors? 😛 And, if you are posting at additional social sites, I would like to keep up with anything new you have to post. Could you list of every one of all your shared sites like your linkedin profile, Facebook page or twitter feed? Hi, I am on FB and Twitter.